The Berkshire Golf Club is home to two Herbert Fowler designed courses, both of which are widely regarded as amongst the best in the British Isles. The Berkshire is a traditional Members’ Club which warmly welcomes visiting golfers all year round to enjoy the beauty of its pine and heather lined courses, and to face the subtle challenges of Fowler’s superb traditional design. The Club is host to The Berkshire Trophy, one of the UK’s major amateur competitions. Past winners include Nick Faldo, Sandy Lyle and Ross Fisher. The Berkshire has also hosted the English Amateur Championship and the British Senior Amateur Championship, and in 2009 it was the venue for final qualifying for the Senior British Open Championship. The Berkshire is one of a group of famous courses laid out amid the extensive trees and heather to the South and West of Windsor Castle. The Berkshire is the youngest of the big three clubs in this superb golfing country, having been founded in 1928, 17 years after Sunningdale and 4 years after Wentworth. 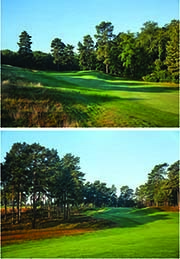 The two courses, Red and Blue, were both laid out in 1928 by the Herbert Fowler, who also designed Walton Heath, and Cruden Bay. Among the great course architects of the era, he is often overlooked, but he had a special talent for designing courses of great natural beauty which blend into their landscape and surroundings. The Berkshire courses are considered by some to be the finest examples of his follow-the–land style. A tribute to his skill is that very few, and only minor alterations have been made to his original design. He had the perfect natural materials, with heather, trees, slopes and streams, and his talent has meant that Nature and man have combined to fashion two courses which are both highly picturesque and offer an exacting, but fair challenge to golfers of all levels.